Nancy and I are not normally early risers — even when we’re traveling. Today is an exception: A balloon lift is scheduled for approximately dawn and that is what we came to see. We are in Winchester, Virginia,* to attend the annual fall balloon festival being held at nearby Long Branch Farm. This morning we are up about an hour before dawn, creep out of our B&B* as quietly as we can, and head a few miles down the road to the farm. We are resigned to missing breakfast. * This is a huge disappointment (and yet more evidence that I somehow married an angel). Arriving in the predawn light, we bundle up against the cold morning and tromp into the festival grounds. There is enough light to see, but the sun is not yet up. There is heavy dew on the ground and mist in all the low-lying areas of the farm. The farm is carefully maintained and beautiful, with an icing of frost on every surface. 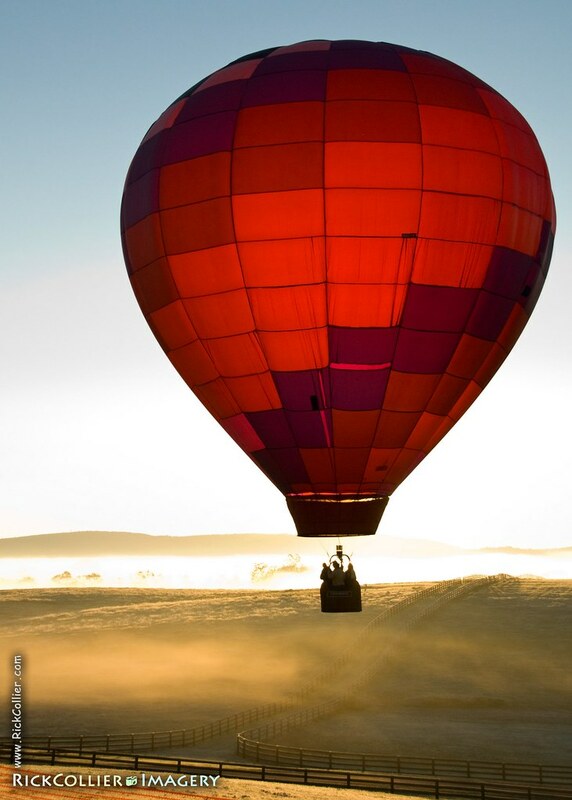 We hear the rushing gas-flame sound of balloons being filled as the sun rises over the distant hills. Several balloons launch, but they stay low and hover carefully near the fields and fences. High winds aloft are predicted, and nobody wants to take a chance. As luck would have it, the balloons move straight out over the fields where the sun is rising. Photography is not going to be easy, but there may be some dramatic high-contrast opportunities. I maneuver as best I can to counter the very bright sun, which has just cleared the hills and now is shining directly into my lens. I use long lenses, high f-stops, and filters — neutral density, split neutral density, and polarizers. Because of the high contrast, the camera is set to auto ISO and doing its best to compensate as I shoot into shadows and light. I see a red and purple balloon lifting behind me, and realize that if I run, I can get to the top of the hill just as the balloon reaches altitude enough to be backlit by the sun. Because I’m moving so fast, I don’t have time to optimize the shot. I put down the split neutral density filter to avoid screwing up the balloon in the foreground, and start shooting. Above is the shot: The sun is directly behind the balloon, making it seem to glow and also back-lighting the mist in the foreground. 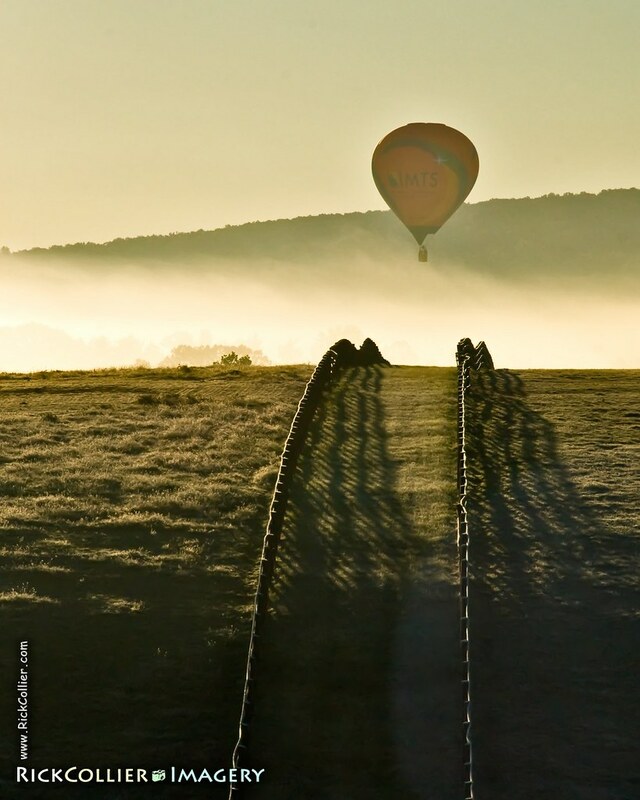 Meanwhile, the mist in the distance picks up the full force of the sun, blowing out all highlights at the horizon and providing a contrasting stark white background behind the balloon. Moments later, I noticed another balloon moving through the mist in the distance, which may be framed perfectly by fences in the foreground. The fences are nicely rimmed with frost, offering the opportunity for sunlit highlights calling attention to the parallel fences and creating “flow” in the scene. To manage the light, I maneuver to get the sun out of the shot, push my Nikkor zoom lens to a long focal length, and use my left hand to supplement the lens hood shading the front lens element. Below is the result of that attempt. * About our favorite B&B in Winchester: We stay at the Old Waterstreet Inn. It is a terrific historic property that is well-maintained, spacious, comfortable, and friendly. Romantic, too. Every morning there is a fabulous home-made breakfast prepared and served by Jeannie, the proprietor. On this day we got back to the Inn too late for breakfast, but found that Jeannie had anticipated this and generously kept our breakfast warm. We got to have our pictures and our breakfast too! This entry was posted on Tuesday, August 4th, 2009 at 19:50 PM. It is filed under Land & Air, thePhotoTourist and tagged with balloon, balloon festival, balloon lift, dawn, farm, fence, festival, field, fog, hot air balloon, mist, not_uw, sunrise, surface, Virginia, Winchester. You can follow any responses to this entry through the RSS 2.0 feed.